Ravisankar, S.S., et al. Critical Congenital Heart Defect Screen in Newborns, A Review of Its Use and Importance. (2016) J Palliat Care Pediatr 1(2): 26-27. © 2016 Ravisankar, S.S. This is an Open access article distributed under the terms of Creative Commons Attribution 4.0 International License. Major structural or genetic birth defects affect approximately 3% of births in the United States. They are a major contributor to infant mortality & morbidity and result in billions of dollars in costs for care. Congenital Heart Defects (CHD) occur in approximately 1% of births in the United States each year and of these neonates with a CHD, 1 in 4 can have a critical congenital heart defect (CCHD). This is defined as the need for intervention by catheterization or surgery in the first year of life. In the first few days to weeks of life, undiagnosed neonates with a CCDH are at significant risk for clinical decompensation and death. Though prenatal ultrasounds are an excellent tool to identify various structural fetal anomalies, studies have pointed to its limitations especially based on the timing of the ultrasound[4,5]. Clinical physical exams in the newborn period have a 50% sensitivity to diagnose CHD’s and even physical exams by expert providers may not safely distinguish neonates with CHD[6,7]. Echocardiograms are effective in identifying CCHD with high sensitivity and specificity ranges of 99.3% to 100% and 90.9% to 100%, respectively, and a negative predictive value ranged from 97.9% to 100%. Though an echocardiogram is a useful diagnostic tool, it is an expensive screening test. In September 2011, the United States Secretary of Health and Human Services endorsed the addition of CCHD screening using pulse oximetry to the uniform routine screening panel for newborns prior to discharge from the hospital. Since then, at least 43 states have legislation in place to screen infants at 24 hours of life with pre and post-ductal oxygen saturations. The remaining seven states support testing with regulations in place. CCHD screening in the newborn period is critical to identify babies at risk and is designed to detect the following defects: hypoplastic left heart syndrome, pulmonary atresia with intact ventricular septum, transposition of the great arteries, truncus arteriosus, tricuspid atresia, tetralogy of Fallot, and total anomalous pulmonary venous return. Coarctation of the aorta is not always associated with hypoxemia; therefore, the CCHD screen may not identify this defect. CCHD screening is performed by placing a pulse oximeter on the right hand of the infant (pre-ductal limb) and either foot (post ductal limb). It is important to do the test when the infant is quiet and preferably awake as crying, eating or sleep may interfere with the results. A neonate passes the screen if the pulse oximeter reading on the right hand is greater than or equal to 95% and there is no greater than 3% difference between the pre and post-ductal readings. Please see (Figure 1) algorithm describing each step of the screening procedure in detail. A systematic review by Thangaratinam, S. found that pulse oximetry screening for CCHD has a sensitivity of 76.5% and specificity of 99.9%. It is recommended to perform the test after the first 24 hours of life as the study found a low false positive rate of 0.05%. When a neonate fails their CCHD screen, it is important to consult pediatric cardiology and obtain an echocardiogram. If an institution is not equipped with such facilities, it is important to transfer the infant to an institution with proper equipment or provide care via telemedicine. Figure 1: Algorithm describing the steps in CCHD screen – From American Academy of Pediatrics. The hallmark of a good screening test is that it has to be noninvasive, cost effective, reliable and reproducible with a high sensitivity and specificity. While screening for CCHD by pulse oximetry satisfies all those requirements, it is important to recognize that it may miss certain congenital heart diseases and a “pass” screen does not rule out the possibility of other heart defects. Thus using it in addition to routine review of medical history, serial clinical exams and judgment makes it a comprehensive and indispensable tool. 1. MMWR. Update on Overall Prevalence of Major Birth Defects --- Atlanta, Georgia, 1978--2005 (2008). Morb Mortal Wkly Rep 57(1): 1-5. 2. Centers for Disease Control and Prevention (CDC). Newborn screening for critical congenital heart disease, potential roles of birth defects surveillance programs-United States, 2010-2011. (2012) Morbidity and mortality weekly report (MMWR) 61(42): 849-853. 4. Mahle, W.T., Newburger, J.W., Matherne, G.P., et al. Role of pulse oximetry in examining newborns for congenital heart disease: A scientific statement from the AHA and AAP. (2009) Pediatrics 124(2): 823-836. 5. Goldstein, M. Critical complex congenital heart disease (CCHD). (2013) Congenital Cardiology Today 11(3): 1-10. 6. Danford, D.A. Sorting through the haystack: Decision analysis and the search for heart disease among children with murmur. (2002) Journal of Pediatrics 141(4): 465-467. 7. Griebsch, I., Knowles, R.L., Brown, J., et al. 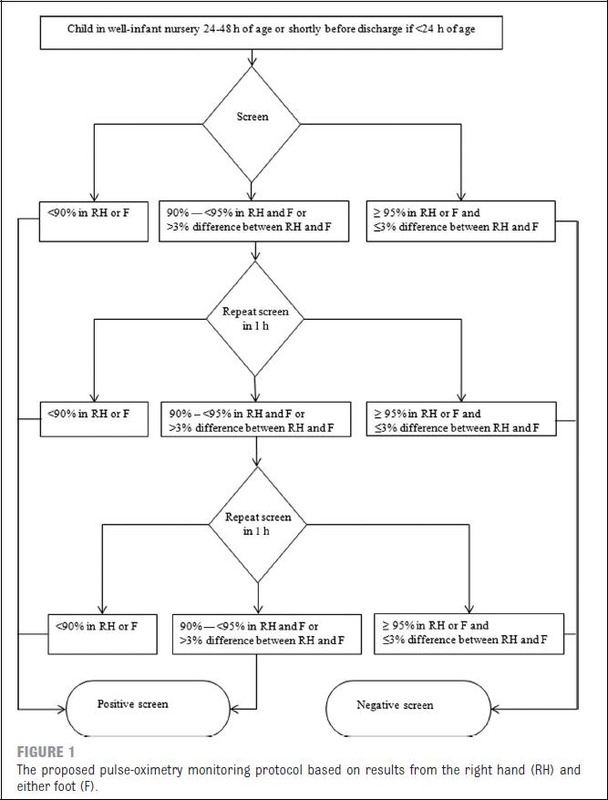 comparing the clinical and economic effects of clinical examination, pulse oximetry, and echocardiography in newborn screening for congenital heart defects: A probabilistic cost effectiveness model and value of information analysis. (2007) Int J Technol Assess Health Care 23(2): 192- 204. 8. Parlakay, A.O., Karagoz, T., Ozkutlu, S., et al. Evaluation of diagnostic accuracy of portable echocardiography in newborns. (2011) The Anatolian Journal of Cardiology 11(7): 627-632. 9. Kemper, A.R., Mahle, W.T., Martin, G.R., et al. Strategies for implementing screening for critical congenital heart disease. (2011) Pediatrics 128(5): e1259-1267. 10. Thangaratinam, S., Brown, K., Zamora, J., et al. Pulse oximetry screening for critical congenital heart defects in asymptomatic newborn babies: a systematic review and meta-analysis. (2012) Lancet 379(9835): 2459-2464.